Issy Randall, proud owner of The Cupcake Cafe, is in love and couldn't be happier. Her new business is thriving and she is surrounded by close friends, even if her cupcake colleagues Pearl and Caroline don't seem quite as upbeat about the upcoming season of snow and merriment. But when her boyfriend Austin is scouted for a possible move to New York, Issy is forced to face up to the prospect of a long-distance romance. And when the Christmas rush at the cafe - with its increased demand for her delectable creations - begins to take its toll, Issy has to decide what she holds most dear. 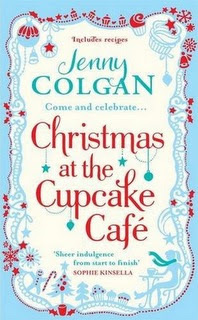 I absolutely loved Jenny Colgan’s first cupcake novel ‘Meet Me at the Cupcake Café’ it was quite literally a delicious read! So when I found out that she had written a follow up novel to this, and that it was set at Christmas, I get seriously over-excited! Although you might think I am setting myself up for a serious case of anti-climax here, I was certainly not disappointed! I enjoyed this novel very much, as devoured every last crumb of it. We return to the Cupcake Café to catch up with Issy, Pearl and Caroline, as well as Issy’s Boyfriend and his little brother, as well as meeting some lovely (and not so lovely) new characters. This time, the reader gets to not only experience the joy of the lovely, cosy-sounding café, but also the bright lights of Manhattan as Issy travels across the pond to visits her boyfriend whilst he is on business there. The wonderful settings are just part of the beauty of this novel. Colgan writes so that you feel the warmth as you step into the café; take in the aromas of freshly baked cupcakes and warm, milky lattes. She doesn’t scrimp on the description of Manhattan either, and you really feel like you have jetted off to The Big Apple with Issy! The fact that this novel is set at Christmas might make the reader think that the storyline is going to be a tad predictable, there’s going to be something to threaten Christmas but that everything is going to be ok in the end, but Colgan keeps you guessing right up until the last minute. And when that last minute finally, came I didn’t want it to end. I found myself hoping that I would get to once again reunite with these diverse, loveable characters and find out what will happen next in their lives (and loves). The storyline is truly gripping and I found myself sharing the ups and downs with Issy, experiencing every emotion that she and her friends experienced over the course of the novel. This is a truly scrummy Christmas read. If you haven’t read ‘Meet me at the Cupcake Café’ I would urge you to do so because you will love it, but you would still be able to enjoy this book on its own merit, meeting the characters for the first time in this novel will not be detrimental to the enjoyment of the story. Readers will also enjoy the recipes that Jenny has put in at the start of every chapter which add a whole-new interactive dimension to the story. This is a book which is a must for getting any fan of Chick-lit into the Christmas spirit!